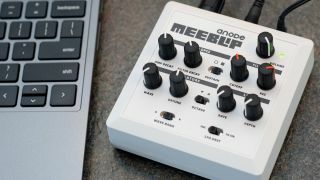 The MeeBlip anode is a fine little entry-level monosynth, and in celebration of its success, the team behind it is releasing a limited edition version. Most obviously, this comes in a white case rather than a black one, but there's also an additional filter envelope that makes it easier to create sweeps and filter effects. There's also a new wavetable mode - engage this and you can use the Wave knob to dial in timbres of the cutting, edgy variety. Find out more on the MeeBlip website. The limited edition anode will ship next week priced at $140. Only 250 hand-numbered units will be made, so you'd be advised to get your order in early if you want one. There's free shipping in the US and Canada until 15 July, and international shipping will be discounted, too.